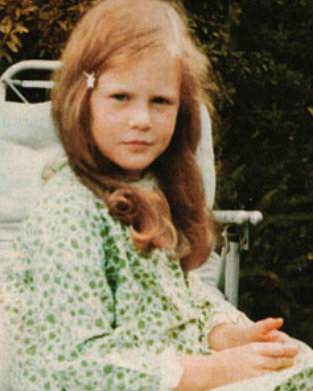 Can you tell me who this young girl is?? On a hot steaming day like today, a game with the name "Waterball" sounds like a wonderful idea, don't it? What is Waterball you ask? 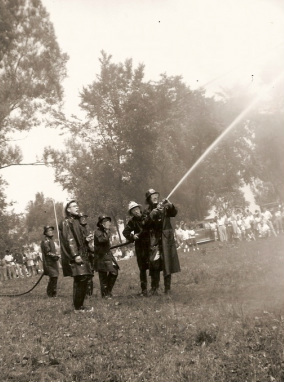 Well... Waterball is a game that firefighters started playing back in the 1940s that helped them with their aim of the water and with using team-work while controlling the water hoses. 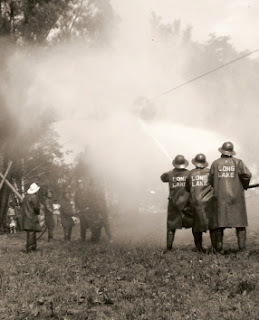 Fire Departments went head to head, shooting a strong stream of water from their fire hoses at a yellow ball strung on a string above them. Which ever team got the ball moved over to the other team's side, Wins the game!! Every now and then, a town will decide to throw a Waterball Tournament! The the Firefighters get to have some fun while also training! How cool does that sound? Man I wish I could play!! Maybe I can make up a home version of the game!!!!!!! Memphis Fire Dept hosted its 2008 Waterball Contest to a win by Richmond Lenox EMS for the 8th year in a row. Firefighters beat the heat with memorial waterball tournament. To live under that place. Puzzle pieces that don't all belong. I saw this picture on my facebook wall and I couldn't help but want to add it to my page! My heart goes out to all the victims of the Movie theater shooting that happened Friday night at 12:30am. 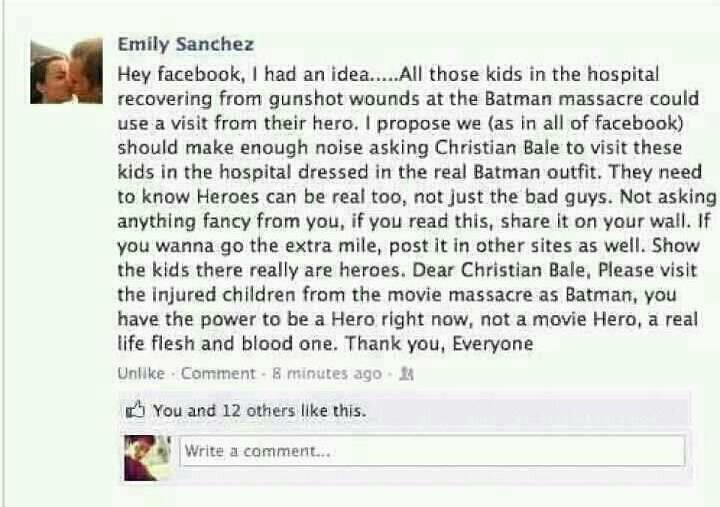 Those people were just wanting to watch their favorite movie premier and got hurts for it, some even lost their life's! They were alot of kids hurt in that shooting that did not deserve it. Christian Bale would be making those little kids dreams come true if he went and seen them in his Batman suit! Give those kids something to smile for, give them hope! Everyone who got hurt or lost someone are in our prayers! 2. Cut along the dotted line and cut off neck band. .5. Pull the ribbon through the casing using a safety pin. Pull tight and tie. 1. Heat the oven to 400 degrees. Sift together the flour, sugar, baking powder and salt into a large mixing bowl. Cut in the margarine with a pastry cutter. Or use a vegetable grater to grate the stick into the mixing bowl and let your kids take turns blending the margarine into the dry ingredients with their fingertips. Once the dough is crumbly, slowly stir in the milk. 2. Turn out the dough onto a floured working surface and gently roll or pat the dough into a 1-inch-thick rectangle (it should measure about 6 x 8 inches). For the best results, handle the dough as little as possible. 3. Slice the rectangle into four 1-1/2- x 8-inch strips. Place the strips on an ungreased baking sheet, then let your child mold and curve them into S shapes that resemble snakes. Bake for 10 to 12 minutes until the bottoms are golden brown. Transfer the baked shortcakes to a wire rack (a parent's job) and let cool. Carefully slice the cooled shortcakes in half lengthwise or split them with a fork and then set aside. 4. Wash the strawberries and let your kids select four to use for the snakes' heads. Slice the rest of the berries lengthwise into a mixing bowl. Toss with the confectioners' sugar and let stand while you prepare the whipped cream. 5. Combine the whipping cream and confectioners' sugar in a chilled bowl and beat with an electric or hand mixer until stiff peaks form. 6. Just before serving, arrange berries on the bottom half of each shortcake, then cover with the shortcake top. Spread on whipped cream and add a layer of sliced strawberry "scales." 7. For the snakes' heads, cut mouth openings in the tips of the whole berries and place one at the end of each shortcake. Press a pair of mini chocolate chip or M&M's eyes into the sides of each head and add a forked tongue cut from green fruit leather. Serves 4. WLOS ABC 13 - Will You have Internet on Monday? WLOS ABC 13 - Western North Carolina's News :: News - Top Stories - Will You have Internet on Monday? Have everybody heard about some people losing their internet tomorrow, Monday? Apparently in 2011 a virus was set out to steal IP addresses. The government busted the people behind it and built lots of new servers to fix what the hackers had "rewired". But now they are closing down the back up, which means that if your computer is infected with the virus that was let out in 2012, then your computer will not be able to access the internet on Monday! There is a way to fix it. Below is an article I found on my local news webpage. Check it out and then click the link to make sure your computer stays in working order!! Will You have Internet on Monday? When the computer trojan virus, DNSChanger, creators were arrested over 8 months ago the FBI began shutting down domains that may have been affected by the DNSChanger malware. The virus, which has been circulating the web from as far back as 2007,redirects internet traffic to sites with paid advertisements where cybercriminals can hack into unprotected computers. Authorities say some 275,000 computers are still at risk. On Monday, the FBI's temporary Internet servers will go dark, leaving thousands of unsuspecting malware-infected individuals without online access. Whats more fun than running around outside on a summer night chasing lightning bugs?? Catching them and putting them in jars for safe keeping! Most of the time you would use one of the gallon mason jars... I have a new idea for you. How about Mini Lightning Bug Jars? Easy to hold in small hands and not likely to be dropped when running thru the yard. These can be made by the child, with your help with the knife, or you can make them for your kids yourself. The choice is yours!!!!!! Step 1 --> Make sure the jars are clean and dry. Step 2 --> Get an adult to poke holes in the top of the lid so the lightening bugs can breath. Step 3 --> Write your name on your jar if you would like and decorate with stickers or draw fireflies with black and orange markers. 4th of July in Downtown Asheville! 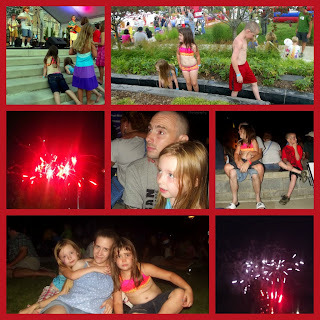 Our Family's Fourth of July Fun!!! The words with a * after them have more information about that place to item at the bottom of this blog. Brooklynd and Ciara chasing Pigeons! My girls with their butterfly wings, Aj was still waiting on his dog. The balloon guy making Aj's balloon. Once we got closer to Pack Square*, we saw this guy who had a flower balloon on his bead and a apron full of balloons around his waist! He was making balloon animals and such for tips. Brooklynd, Ciara and Aj HAD to have a balloon so we stopped. The girls ended up with Butterfly wings while Aj got a dog on a leash. Then off to the festivities we went! The first thing the kids seen was a big blow up slide! Before the kids could get on the slide we had to sign a weaver and get them a bracelet, so we did.. Easy Peasy! They all went on the slide (my youngest got scared and climbed back down the latter but the other 2 had fun) I was a bit upset to find out that Splashville* was closed :0( They had live music set up on the new walkway/stage they recently built in front of the court house, so the sound guy and all his buttons and such, were set up st the back of Splashville, where all the water should of been coming up. It ended up being a dance stage for all the kids to play and dance to the music on. These 3 young girls, I'd say they were between the ages of 8 to 10, came out onto Splashville platform with hula-hoops. And next thing I know they are hula-hooping to the music! I have to say, that I think of myself as a pretty good hula-hooper even though I'm 24 :0) But these girls had me beat by a long shot! They were swirling the hoop on their arms, head, legs, ect all while not missing a beat... unless one of the other kids ran into their hoop.... that seemed to happen often but the girls never seemed to get aggravated when their hula-hoop got hit and knocked to the ground. They hula hooped for a while, every now and then one of the girls would go sit down and then a few minutes later she would be back out there. My daughters wanted a hula hoop so they could hula-hoop dance with them :0) It was an awesome unexpected show to watch! We LOVED it! I got some of it on video and took alot of pictures!! They also had craft tables sets up along with face painting. The girls doing the face painting were not the best artists but the kids didn't mind. Once we started walking around, we noticed that since Splashville was closed, alot of the kids were playing in all the random fountains that Asheville has placed around and about downtown. So of course my kids run straight for one and starts playing. It wasn't long before someone walked over and told me to get my kids out of the fountain so we just moved on to the next one :0) I mean , COME ON!! It's 90 something degrees outside and everyone was expecting Splashville to be on, so most of the kids were in their bathing suits anyways! After a bit of water fun we walked back down to the grassy area near the stage and Splashville and sat down and enjoyed the music. Me and my girls got up and danced in front of the stage and on the water platform a few times! We had a BLAST! 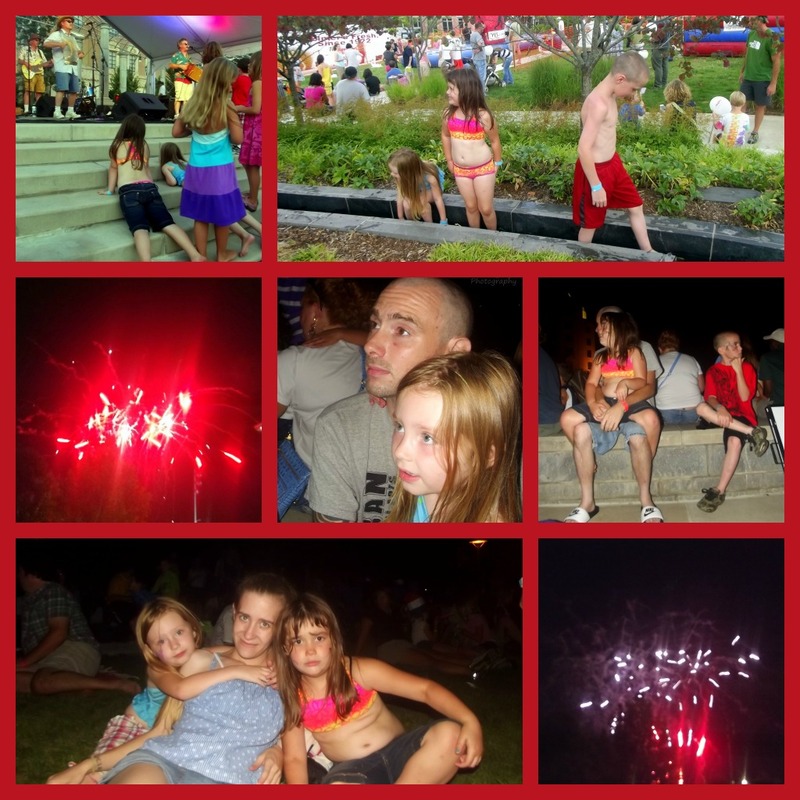 Our 4th of July fun in downtown Asheville!! *Pack Square ~ Downtown Asheville's historic Pack Square has transformed into a beautiful public park with 6.5 acres of public space for visitors to relax and linger. In addition to the Roger McGuire Green in front of City Hall and the County Building, the new park has a large open green space on a slope overlooking the main stage, three water features and original, large-scale art by regional artists. There are many seating areas surrounded by native trees and shrubs. A granite Veterans’ Memorial stands near the courthouse at the northeast corner of the park. I hope you enjoyed hearing about our 4th of July and we hope that your holiday was as wonderful as ours!! Step 1--> Heat oven to 350°F. Make and bake cake mix as directed on box for 13x9-inch pan, using water, oil and eggs. Cool completely, about 1 hour. Step 2--> Line cookie sheet with waxed paper. Crumble cake into large bowl. Add frosting; mix well. Using 1-inch scoop, shape mixture into balls; place on cookie sheet. Freeze about 45 minutes or until firm. When firm, transfer to refrigerator. Step 3--> In 1-quart microwavable bowl, microwave red candy melts uncovered on High 1 minute 30 seconds; stir. Continue microwaving and stirring in 15-second increments until melted and smooth. Step 4--> Remove a few balls from refrigerator at a time. Using 2 forks, dip and roll 1 ball at a time in red coating. Return to cookie sheet; immediately sprinkle with red sugar crystals. Dip a total of 28 cake balls in red coating. Step 5--> Repeat melting instructions for white candy melts. Dip a total of 23 cake balls in white coating; immediately sprinkle with sparkling sugar. Step 6--> Repeat melting instructions for blue candy melts. Dip remaining 12 cake balls in blue coating; immediately sprinkle with blue sugar crystals. Refrigerate all coated cake balls about 10 minutes or until set. Step 7--> On serving tray, arrange cake balls in flag pattern in 7 rows, starting from the bottom: 1 row of 9 red balls, 1 row of 9 white balls, 1 more row of 9 red balls, 1 more row of 9 white balls, 1 row of 4 blue balls and 5 red balls, 1 row of 4 blue balls and 5 white balls, and 1 more row of 4 blue balls and 5 red balls. Store tightly covered. Serve at room temperature. 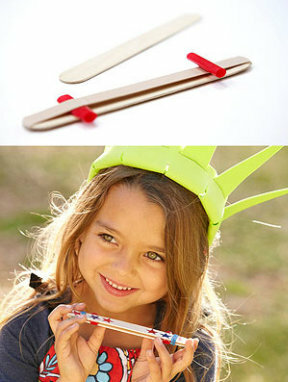 Create simple quacking noisemakers, and the kids can be ready for the fireworks or parade. First, cup two 1 1/4-inch lengths from a plastic drinking straw. Stretch a wide rubber band lengthwise around a jumbo craft stick. Slide one straw piece beneath the rubber band 1 1/4 inches from one end. Lay the other straw piece on top of the rubber band 1 1/4 inches from the opposite end, as shown, then sandwich it with another craft stick. Secure the sticks with more rubber bands. Decorate the noisemaker with stickers if you like. 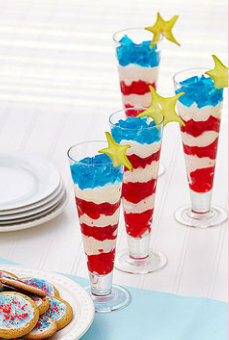 A spiked 4th of July Treat that will make anyone feel like a kid again! (Make sure that if you have kids at the party that you also make a kid friendly version also with water or juice instead of the alcohol ) You can also use others colors other than Red, White and Blue for other celebrations! Lightly spray 4 1 lb loaf pans (about 8" x 5") with cooking spray. Wipe out with a paper towel. Cut the gelatin into 3/4 to 1" strips, wiggling your knife to give an uneven edge (like rock candy). If you cut the strips too thin, they will break when skewered.